Trails are open, Eagle River and Groat Creek staging areas are also open. Trails remain open and in good spring condition,watch for bare patches mostly on the south facing hill tops. Both the rivers have overflow water and open spots. It is NOT recommended to ride from town, or on the rivers due to unstable and melting ice on the rivers. 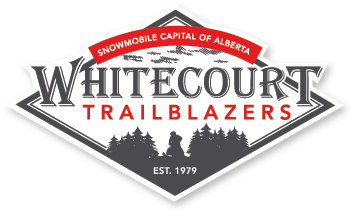 Whitecourt Trailblazers – TRAIL REPORT – for the week of March 10 – 16, 2014. “Golden Triangle between Whitecourt – Swan Hills – Fox Creek is 100% groomed and in great condition. The Trailblazers led a group of 60 riders around the entire Golden Triangle Trail on Saturday March 8, 2013 (220 miles / 350 kms). Much of the Whitecourt Trials were groomed Monday March 10, 2014 and Tuesday March 1, 2014 ( this week!). The Trailblazers are riding the Golden Triangle in one day, Saturday March 8th. This 10 hour ride is not for the faint of heart. Pack a lunch, extra fuel and oil, and a tow rope (just in case). Leaving Eagle River Staging Area at 8am sharp. Riding to Swan Hills, gas up, then ride to Fox Creek, gas up, then back to Whitecourt. Will be 10 hours or less. 220 miles. Novice riders are not recommended as this is a very long day and a fast pace will be required to complete the ride before dark. So Saturday, March 8th at Eagle River Staging Area at 8am! enjoy the ride as the weather should finally be much better!! !